This is one of the most difficult reviews to write of any since I started this blog. I usually get a perverse kind of pleasure from writing about films I didn't enjoy, but this has not been the case with Anand ("joy," as well as the lead character's name), which I watched months ago and haven't brought myself to review until now. Dr. Bhaskar Banerjee (Amitabh Bachchan) is a young physician with a gloomy outlook. A workaholic, he takes his work to heart and doesn't see much to enjoy in life. 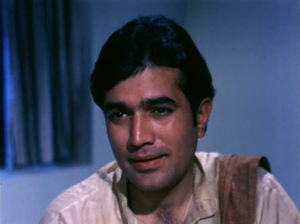 Then his mentor introduces him to Anand (Rajesh Khanna), a cheerful soul who brightens the spirits of everyone he meets, including the dour doctor. But Dr. Banerjee is dismayed to learn that Anand has an inoperable, terminal cancer, and a prognosis of only a few months to live. Anand is determined to spread as much joy as he can in the short time he has left, and from him Dr. Banerjee learns to appreciate all aspects of life. I wanted to like Anand; I love so many of the films of its director, Hrishikesh Mukherjee, and I adore the performances of young, pre-stardom Ambitabh Bachchan. And The film is so widely loved, and had been recommended to me by so many different people, that I feel like an insensitive philistine for failing to appreciate it. Yet just about everything about it grated, starting with the hyperactive cheerfulness of Anand himself. I've not found a single appealing quality to Rajesh Khanna, between his froggy smile and his mumbly, droopy-eyed diction; here, he combines these traits with a ferret-like energy that is by multiples more annoying than charming. But it's not merely that Anand's idea of cheerfulness is too shouty and bouncy to appeal to me; it's that everyone in the film is as delighted by it as I am irritated. Even the somber doctor, a man who looks like he should be getting migraines from Anand's very presence, is instead moved to the depths of his soul. I understand how I am supposed to feel, but I can't get on the train; instead of being charmed by Anand's joy, I just want him to shut the hell up. Anand is not merely terminally ill; he's terminally annoying. Beneath the surface - of course - Anand harbors some melancholy, which shows itself only in quiet moments when he thinks he's not being watched. This feature of Anand's character is such an obvious cliche that it adds no depth to him at all, and I found myself only rolling my eyes when it was revealed. It's just one more predictable step in the very predictable arc of this entirely by-the-book story. Anand's inevitable end - the conclusion is painfully apparent from the moment Anand is introduced - brought me no tears, just relief that it was finally over. I suppose the saccharine sentiments would have been forgivable if the characters had worked, but between Anand's hysterical babble and the doctor's sour-lemon demeanor there wasn't much to sink my teeth into. The entire experience was like biting into a puff of cotton candy and finding it artificially sweetened, bitter with aspartame aftertaste. Though one of the best-loved emotional tear-jerkers of Hindi cinema, Anand's delicacy was completely lost on me. ETA: I feel somewhat less self-conscious and thick about disliking this film after reading Philip Lutgendorf's astute (as always) comments on it. He notes, as I did, that whether one is moved by the film depends upon whether one is charmed or irritated by the character of Anand; he also observes that Anand is an archetype of the manic, self-centered embodiments of romance heroes all over Hindi cinema.